For all the camo knife enthusiasts, here's a good companion product. 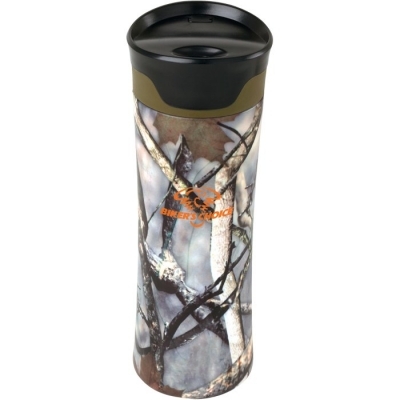 This 15 oz stainless steel double walled vacuum insulated tumbler keeps your liquids hot or cold longer than most tumblers. Dual walls of 18-8 stainless steel for maximum retention of heat or cold, at least 6 times longer. Includes a twist on lid with a non-skid bottom to provide stability. Featuring a side push button lock that is built-in to the lid that prevents accidental spills while transporting. We use FDA approved materials for your safety. BPA Free. Hand wash only, and avoid submersion for extended periods. The price includes your imprint in 1 location, 1 standard imprint color.